Kitty Dukakis has battled debilitating depression for more than twenty years. Coupled with drug and alcohol addictions that both hid and fueled her suffering, Kitty?s despair was overwhelming. She tried every medication and treatment available; none worked for long. It wasn?t until she tried electroconvulsive therapy, or ECT, that she could reclaim her life. Kitty?s dramatic first-person account of how ECT keeps her illness at bay is half the story of Shock. The other half, by award winning medical reporter Larry Tye, is an engrossing look at the science behind ECT and its dramatic yet subterranean comeback. This book presents a full picture of ECT, analyzing the treatment?s risks along with its benefits. ECT, it turns out, is neither a panacea nor a scourge but a serious option for treating life threatening and disabling mental diseases, like depression, bipolar disorder, and others. 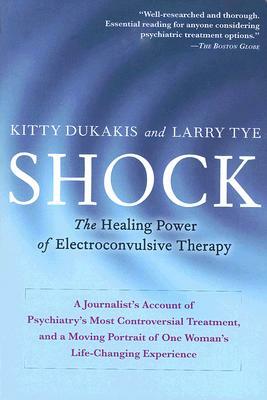 Through Kitty Dukakis?s moving narrative, and interviews with more than one hundred other ECT patients, Shock: The Healing Power of Electroconvulsive Therapy separates scare from promise, real complications from lurid headlines. In the process Shock offers practical guidance to prospective patients and their families, boldly addressing the controversy surrounding ECT and awakening millions to its capacity to heal. Kitty Dukakis, the wife of former Massachusetts governor and 1988 Democratic presidential nominee Michael Dukakis, is a well-known and much-loved public figure. She revealed her ongoing struggle to overcome depression and her accompanying addictions to alcohol and pills in her 1990 memoir, Now You Know. Larry Tye is a journalist, and spent fifteen years at the The Boston Globe. He has won numerous awards, including recognition from the Associated Press. The author of three previous books, he has taught journalism at Boston University, Northeastern, Tufts, and Harvard, and now runs a Boston-based fellowship program for medical journalists.